I have been watching the price of gold closely. I’m tracking its short-term swings and anticipating where the next move will be. And while I expect gold to make another move lower, I couldn’t help but notice it recently broke out into a new bull market. 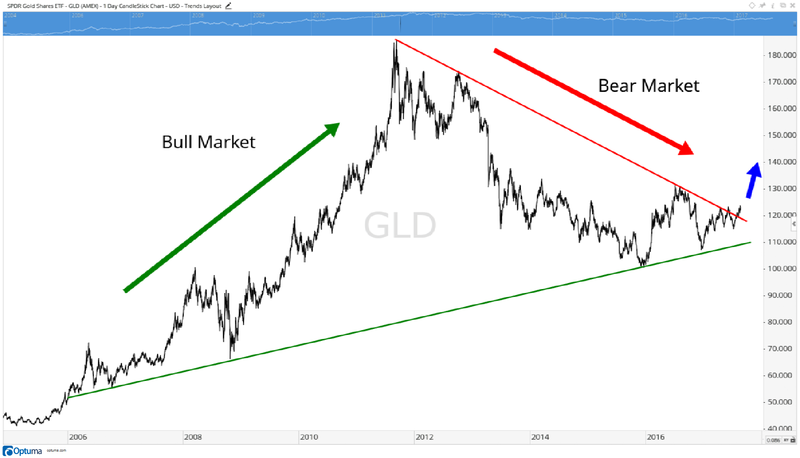 When I looked at gold over a long-term chart, there were two distinct markets it experienced over the last 12 years: a bull market followed by a six-year bear market. In the chart, you can follow the arrows. The first green arrow shows the massive bull market gold experienced that actually started in the early 2000s. Then the red downward arrow highlights the six-year bear market that just ended as prices rose above the red resistance trend line. The blue arrow is pointing out the upcoming bull market — one that will send gold to historic levels. It won’t be a straight ride up. As you can see from the previous bull market, there were some extremely volatile moments that would have created concern for you as a gold buyer. But in general, buying and holding gold for the next several years will have a good payoff.